American's millionaires control about two-thirds of the nation's wealth, a far greater concentration of wealth than in any other country in the world. About 66% of U.S. wealth in 2015 was held by households worth $1 million or more, according to a new report on global wealth by the Boston Consulting Group. That compares to 46% of the wealth worldwide that's held by millionaires. Wealth is less concentrated in the hands of millionaires in other developed economies around the globe. 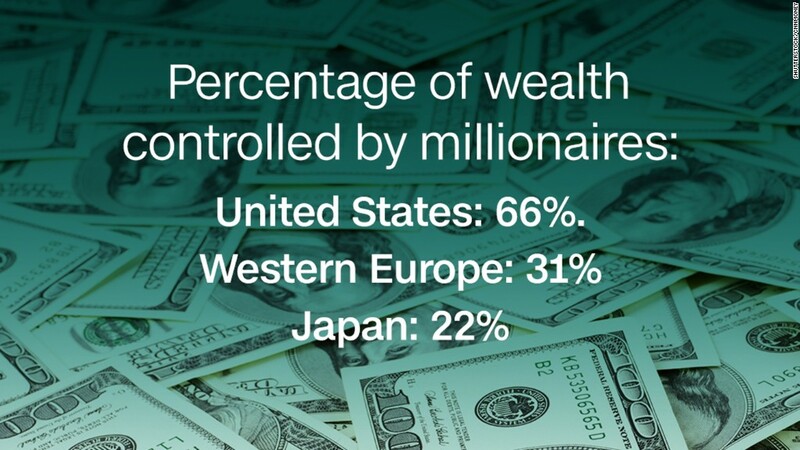 In Western Europe, millionaires control 31% of the wealth, while in Japan the figure is 22%. Elsewhere in the Asia-Pacific region, 44% of the wealth is held by millionaires. Eastern Europe, the Middle East and Africa are the only other regions besides North America where more than half the wealth is controlled by millionaires -- averaging about 55% percent. And the concentration of wealth is expected to keep increasing. Boston Consulting Group projects that 71% of U.S. wealth will be in the hands of millionaires by 2020. Anna Zakrzewski, a Boston Consulting Group partner and coauthor of the report, says that the millionaires are accumulating more wealth worldwide because of investment gains, which outpace growth from wages and other income. "They're able to invest into asset classes with higher returns, even if they're a bit riskier," she said. The number of millionaires worldwide grew by 1.1 million, or 6%, last year to 18.5 million, and about half that growth was in Asia-Pacific region, including China. Western Europe was responsible for about a third of the growth. But the United States still had by far the most millionaires, with 8 million households crossing that mark, compared to only 2 million in China and 1 million in Japan.